Sales of ARP Stream will add to the Group Buy Member count to help it along. The Stutter Sequencer allows splitting up each step into up to 32 stutter repeats which can range from rhythmic repeats to glitchy. There is also a Fade button which will fade them out to create a delay type of effect. The Mode Sequencer has 26 different options per step. The first 13 deal primarily with Pitch (with the exception of Chord) which includes play Lowest/Highest held Note, play an Octave below or a Power chord etc.. These modes are followed by time based Modes (‘X/Y’) which rotate through Y steps only playing X notes. So 2/3 will play the second count of each 3 counts. Finally there are some random percentage modes consisting of 25%, 50%, 75% and 90%. 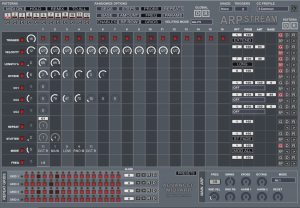 The last Sequencer allows overriding the Main Frequency setting and can create some very experimental and chaotic Rhythms. Th standard straight Frequencies are all lined up at the beginning and then followed by more exotic clock divisions. There is a sophisticated Randomizer System with lots of options including local and global Randomizers. It’s a difficult machine to randomize really due to the potential for chaos everywhere in how everything combines so the Row randomizers are probably much more useful than the Global ones. It uses 12 patterns which is made up of all settings and they can be selected via the Midi Note Octave or via the GUI buttons.